Discussion in 'Fraggle Rock' started by Phillip, Oct 7, 2010. The day Fraggle fans have been waiting for is almost here. On Sunday October 10, the Discovery Kids Channel will be replaced with a new network entitled "The Hub." If you currently have the Discovery Kids Channel, then you'll receive The Hub beginning Sunday. Fraggle Rock will begin airing on Sunday appropriately enough with “Beginnings.” It will be the first time in nearly ten years since Fraggle Rock has aired on US television. 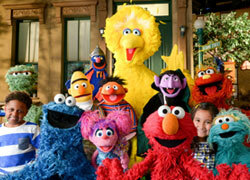 "The Hub" will feature many classic children's and family programs from the 1970's, 1980's and 1990's. Here’s the schedule for the episodes during the first week. All times are listed in Central Standard Time. Find out more info on the Hub at www.hubworld.com. Today’s the day. Post your thought’s on The Hub’s premiere, their programming schedule and the return of Fraggle Rock to national television. Has anyone noticed that Red is in pretty much every advertisement for The Hub? Yippee! Just an hour and a half away! Watching it right now. I recorded it so that's why i'm watching it now. Cool to see it finally on TV after all these years. I wonder if they would do any of the HBO preview of the next episodes. You know the ones they put on the DVDs bonus features. I saw one trailer or Promo for the HUB right before Dennis and Gnasher. I just hope they do like, "Tonight on Fraggle Rock...........at 7:00 pm or 8:30 am." Those types. I still have to determine if I get this channel. But I'm very glad to see Fraggle Rock back on TV! Woohoo! Hip Hip Hooray! We're gonna dance and sing all day! I'm watching "Beginnings" that I DVR'd from their HD channel. From the very beginning (pun) you can notice a few changes. First it's in widescreen, but not stretched. So the top and bottom of the show have been cropped off. 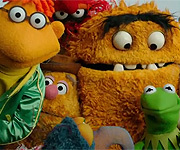 Doesn't look too bad, but in large singing shots the high up background Fraggle's heads are cut off and in the opening Gobo's mouth gets cropped off a bit. It's been edited, presumably to leave more room for commercials; right after the Gobo reaches the cave and meets up the rest of the main Fraggles, the middle is gone (no Fraggle sign off "Gobo, Wembley, Mokey, Boober, Red", no Gorg's Garden) cut right to Wembley jumping in to pond and the original title screen. YES, The Original Title Screen: "with Jim Henson's Muppets" NOT the HIT edited screen "Jim Henson's Fraggle Rock"
At the end of "Follow Me" they cut to a commercial break, making the end guitar riff fall into two parts and it looses some of the emotional impact. They also cut Phil, Gunge and the Trash heap's line about friends are are good for somethings and that even Phil and Gunge are useful sometimes. The last edit I noticed was right after Doc says "I'll board that old hole up one of these days" in the original, there is a pause, then fade out for commercial. Hub's goes immediately from the last line ("days") to the credits, making what Doc said seem more ominous then it is. It's funny to miss a 5 second pause and notice it not being there. For whatever reason The Hub is not using the designated commercial break spots. I can't remember, but was this the same way for other commercial TV airings? So be aware, it's great to have Fraggle Rock back on TV for new audiences to enjoy and it looks great in HD, but the picture has been cropped to make it widescreen and the show itself has been edited a bit to keep up with ever increasing amounts of commercials. I wonder if The Hub will also be airing their classic sitcoms like The Wonder Years, Doogie Howser and Batman edited and in cropped widescreen. I'll be sure to DVR them tonight to find out! I noticed that too. I kinda wished they wouldn't do that. That would only mean they might edited out lots of other stuff. Stuff i wouldn't know (even tho i have the DVDs) only because i don't remember that much stuff. The opening is the only thing i noticed but didn't pickup on Philo and Gunge's scenes. I don't mind recording them to DVD but i'm only doing it for it hadn't been on tv for along time. I won't be able to pick out if they do it to the rest of the other shows. But i hope not. I want to watch "Batman, Doogie Howser, Wonder Years, Laverne and Shirley all in their oringal airing but we'll see when air. Just got through watching the Fraggle Rock episode on The Hub today (Invasion of the Toe Ticklers) and the only edit i found was at the end of the show. Doc is telling Sproket about how everything is going to work out for the better and that they need to know where to now put his doghouse. Well on the DVD version Doc gives Sproket the thing he's been wanting the whole time Doc's been talking and at the end of the one on The Hub right after he tells Sproket about moving his doghouse it cuts off to the ending credits. Just thought i would bring this up. I'm ok with it but kinda wished they would broadcast the whole thing. Oh well just glad for the Fraggles to be back on TV. On the OnDemand versions, the edits are there, but the shows are shown in 4:3 instead of cropped 16:9. Some other edits I noticed was in the begginings at the part when Uncle Matt first tries to go into outerspace and on the full version he says "seems to be blocked, very strange..."
In Wembley and the gorgs the part is cut out at the beggining after Doc gives sprocket the kettle collection magazine , and says "And here's another postcard to that Gobo Fraggle charachter, WHY are we ALWAYS getting postcards to someone named Gobo Fraggle!" I did the math: The Hub is using the same rerun package that aired on the Odyssey Channel about 10 years ago. I DVR'ed "Wembley and the Gorgs" this morning and compared it to my old Odyssey edit notes of the episode. Same results. I kinda thought they might be using the same version of the Odyssey Channel. I never had that channel but that was the last time i remember the Fraggles being on air before the DVDs came out. I wouldn't ever seen the cut for Wembley and the Gorgs about the postcard. Pretty funny i didn't catch it. When the Hub Airs "Marooned" I'm sure we won't see the part where Gobo points and says where the Spiral Cavern really is. Why do you say that? Was that part edited from the Odyssey too?